When 16-year-old Griet's father loses his eyesight and can no longer work, she becomes a servant to the artist Johannes Vermeer in order to help support her family. From the start, she doesn't feel she belongs in the Vermeer household. The artist's wife, Catharina, is jealous of the girl because Griet is given access to her husband's studio ~ a place she is not allowed. One of their many children tries to sabotage Griet from the start. And the servant who is already in the home offers her a lukewarm welcome, to say the least. In Girl with a Pearl Earring, Tracy Chevalier has written a historical novel that aims to reveal one possible story behind the Vermeer painting by the same name. She has taken the girl who appears in the painting, and brought her to life in the character of Griet. 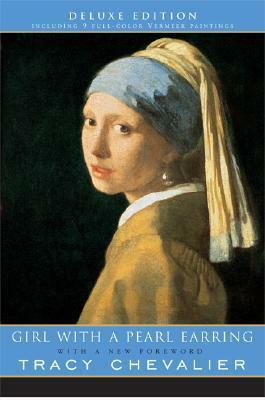 It's an interesting concept, and I really enjoyed her descriptions of the scenes where Vermeer actually creates the painting itself, as well as the explanation of why the painting was done in the first place. But I've struggled to write this review, because while it was interesting to read about this time and place ~ 17th century Holland ~ I just never felt connected to the story or the characters. It felt a little flat to me. Reading the many reviews of this book, it seems the big thing is the romance between Griet and Johannes. But I never felt it. It seemed like she had a bit of a crush on him, but he never seemed to care for her. He was nice to encourage her artistic abilities, letting her help in the studio beyond just cleaning it. But that was all I got from their relationship. I kept thinking something more would happen. And I thought all the secrecy around her helping him in the studio was overdone. I know this book has gotten great reviews, and I will be discussing it at book club later this month so I'm interested in hearing what others thought. But for me, while an easy read, it wasn't very interesting or engaging. I never felt an emotional connection to the story or the characters. I did enjoy the historical aspects of it, though, so that brings my rating up a bit. This review was written based on copy of Girl with a Pearl Earring that I borrowed from the library. Sorry that this one didn't wow you. I usually find that Chevalier's novels add a little something different to historical fiction. The only book of hers I didn't really like was Burning Bright, although I have yet to read Remarkable Creatures. I did enjoy the historical aspect, just had a hard time with the storyline itself. Julie--I remember this novel as somewhat dry myself. With Vermeer's paintings, at least the landscapes, you have to lean right in to get the "gasp" factor of his technical brilliance, his deep love of his subjects. I kept leaning in to this novel and never quite gasped. I can imagine him pouring most of his intensity into his paintings and not his cohorts! Wife and kids included. I just found this book on my shelf. Didn't even know I owned it. I recognized the cover from your blog and put it in my queue for reading. Thanks.